Affordable Corporate Suites in Concord is just outside of Charlotte and 2 miles from Charlotte Motor Speedway, the unofficial home of NASCAR racing. The area also includes the Concord motorsports park and the new drag strip “Z-Max”. In addition to many exciting races, the Speedway also hosts major music festivals, Veterans celebrations, car shows and much more year-round. Numerous major race shops and related attractions in the area are open to the public. In addition, North Carolina’s most popular tourist attraction, Concord Mills Mall is just 3 miles away, offering an impressive array of name-brand discount stores and wonderful restaurants. Reed Gold mine, where visitors can pan for gold, is just one of many local attractions. And downtown Charlotte is only 20 minutes away. You’ll find our fully furnished suites provide you with a truly comfortable, spacious, clean and affordable “home away from home.” Every suite has a queen-sized bed and large closet, and Standard and Executive Suites have separate bedrooms. 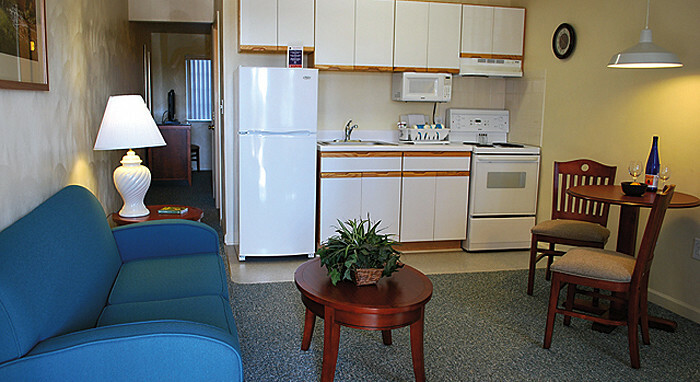 Every suite has a kitchen with dishes and full-sized appliances. Many people say the large suites are more like apartments than hotel rooms. Our Concord hotel now has 5 suites equipped with new high-quality sofabeds that allow traveling work crews to sleep two workers per room to save money. While most of our rooms only have one queen-size bed for individuals or couples, these 5 ground-floor rooms will allow your workers to stay for under $40 ($20 per person) a night based on weekly pricing! All utilities are provided, including HDTV with HBO and DVD player, phone service and free high-speed Internet (both Ethernet and Wifi). Weekly housekeeping gives you fresh towels and linens. Laundry facilities are on site. All locations are smoke free. This is the best hotel value in the entire Concord area.